We flew out of the tiny airport at Siem Reap (it had a temple-style tiled roof and peaceful little garden inside) and landed at the tiny airport in Luang Prabang. We've been flying a lot more than envisaged on this trip, having evaluated the alternative as being two days of overland travel including a sleeper train plus 15-20 hours of bus time, not something we were willing to consider at this point. Having heard many good things about Luang Prabang, we were excited about arriving and it did not disappoint with its fantastic mountain scenery, beautiful temples, wooden houses and gorgeous night market. It didn't start out brilliantly for us - we found a cheap guesthouse which seemed good until we switched the fan off and realised it smelled a bit of wee, then we were kept up into the small hours by noisy Aussies (in those wooden houses you hear everything) and woken early by construction work. Dgym was feeling ill the next morning and we had to find somewhere with a nicer bathroom in which he could comfortably hurl. We found a similarly priced much nicer place tucked away in a quiet sidestreet and not made of wood, and we slept better after that. Dgym recovered quickly, but still lost a day of valuable eating time. In the meantime I was exploring the town. On the first day I had a Thai/Lao body massage which aims to encourage flexibility - certainly not the relaxing kind, I spent an hour being pummelled and contorted around as the masseur attempted to push my limbs into various poses and also to pull all my fingers and toes off. Unfortunately I have ticklish knees and couldn't keep in the giggles as she worked on my legs. 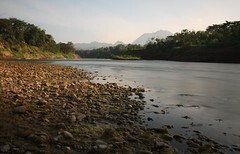 At Luang Prabang, the wide Nam Khan tributary flows into the enormous Mekong river. A rickety bamboo footbridge spans the Nam Khan for half the year - it is rebuilt every year after the rainy season. On the other side is a small river beach from which you can wade out to a sandy island in the middle. I crossed very carefully one afternoon, unplanned and with a bagful of camera and other vital non-waterproof stuff on my back, hoping the current wouldn't knock me over backwards and dunk the lot. I sat on the island and watched local boys dart back and forth across the same stretch of water, then took some pictures to justify risking my stuff like that. 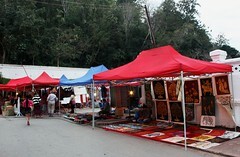 My favourite thing about Luang Prabang was the night market. It sets up on the main street at dusk - walk through at the right time and you will hear the monks drumming as the sun drops in the sky and the vendors set up their tents, hanging paper lanterns, laying out rows of silk scarves and bags onto mats on the ground as well as more dubious items such as animal teeth and bottles of snake whiskey (that's whiskey with a snake in it). This was where I had my best ever Christmas shop. No icy cold wind, no crowds of stressed out shoppers and best of all no cheesy christmas music. The seller sits on the ground behind their goods, and hands you a low stool to sit opposite from which to view scarf after scarf, examining different colours, textures and fabrics - no rush. After the choice is made, the haggling begins. I've had mixed feelings about haggling on this trip - generally we haven't done it much, reasoning that the discount probably makes a lot more difference to the seller than it does to us (plus we're uptight and British and quite simply not used to it). However, prices are often given with the expectation that you'll try to negotiate it down and I sometimes can't help feeling like I'm depriving the seller of their favourite sport. I very much got into it that evening, sometimes placing an initial offer at about 75% of theirs, sometimes aiming for a particular figure so pitching a fair bit below that. Sometimes they'd meet my final offer, sometimes I'd meet theirs. Nobody pays more or accepts less than they're comfortable with, everybody has a little fun and it adds a little extra human interaction and challenge to the sale. Hungry after a good shopping session, I met up with Dgym and we headed to the tiny sidestreet filled with lots of tasty food stalls and also some not so tasty-looking ones that sold pretty much every part of a chicken you can imagine and some you probably can't. The tastier ones involved a vegetarian buffet and barbecued meat and fish on sticks, accompanied by a lovely Beerlao, which has been the nicest of all the beers I've had out here. Dessert on the market consisted of tiny pancake-like coconut cakes. I don't know what they're called but they're cooked over a fire in a specially shaped pan which acts as a mould. Batter is poured into the pan and cooked to make tiny delicious hemispheres which are put together to make a little cake about the size and shape of a flattened golf ball. The texture is soft and slightly wibbly and apparently they're made with rice and coconut. We were too busy eating them to take any pictures.